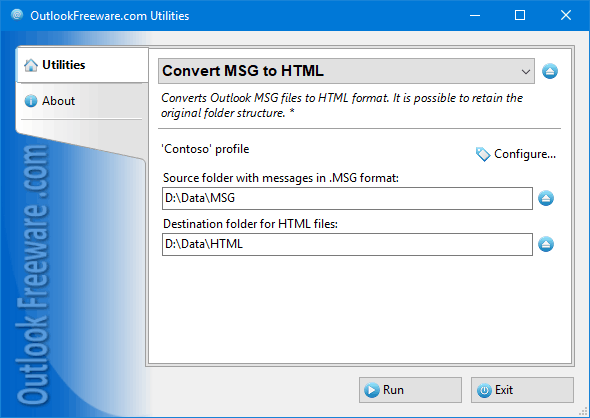 This free utility converts messages from Outlook MSG to HTML files. Outlook uses the MSG format when you drag and drop emails to Windows folders or save messages. This is a native Outlook format that is useful for migrating, backing up mail, or migrating email messages from Outlook to another computer. However, additional programs are required to open MSG message files on a mobile phone or another computer. Convert your MSG message files into HTML to view the messages using any web browser. The HTML files will contain the sender and recipient addresses, the date, subject, and text of the message with the original formatting preserved, as well as links to any attached files. The attachments will be subsequently saved to a separate folder. Key utility benefits: - Converts Outlook messages from MSG to HTML, preserving the original folder structure. - Saves all attachments to a separate folder, including hidden and inline attachments. - Saves attached messages and other embedded Outlook items to individual MSG files. - Stores recipient and sender information from MSG to HTML files. - Converts MSG files to HTML safely, renaming or skipping existing files if necessary. - The command line application enables batch message conversion from MSG to HTML files. Support for the command line allows you to use the utility as a part of command files, scripts, and other scripts too. Command line app is handy for converting MSG messages to the HTML format by a schedule in Windows Task Scheduler, or to convert many files with complex folder structures on multiple computers at once. If you want to convert messages from Outlook instead of MSG files, use another tool we provide for exporting email messages from Outlook to HTML.